The Cardinals make their first regular season appearance ever at Gillette Stadium and close the road portion of their 2008 schedule with a Sunday afternoon game against the 9-5 Patriots. Arizona has already secured a playoff spot as NFC West champions while New England is presently in a three-team log-jam atop the AFC East (Dolphins & Jets) and fighting for a postseason berth. A week after clinching the NFC West title with a 34-10 home win over the Rams, the Cardinals fell last week to the Vikings 35-14. The visiting Vikings jumped on top early thanks to a punt return touchdown and a pair of Arizona turnovers that both led to Minnesota TDs. Those scores staked the Vikings to a 21-0 after one quarter and it was an uphill battle from there for the Cards. New England is coming off a 49-26 win at Oakland that upped the Pats record to 9-5. That mark has them in a three-way tie for first in the NFC East with the Dolphins and Jets. The Patriots have won three of their last four – road wins over Miami, Seattle and Oakland and a home loss to Pittsburgh. Arizona’s week 14 win over the Rams gave the franchise its first playoff berth since 1998, a division championship for the first time since ’75 when they were in St. Louis and the NFC East, and assured the team of its first home playoff game since 1947 in Chicago. 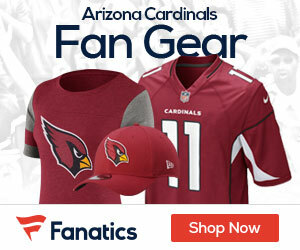 The Cardinals close the regular season with a home game against Seattle next Sunday at University of Phoenix Stadium. The Patriots will be in Orchard Park, NY to take on the Bills (6-8) in their regular season finale.